Recorded in many spellings including Honeybell, Hunnaball, Hunnable, Hannibal, Hunnibal and the Latinized Hannabus, this is a surname of several possible origins. Firstly it may be from an early pre 7th century Germanic personal name "Hunnbald". This name was introduced into England by the Anglo-Saxons of the 5th century. As such it was composed of the elements "hunn", meaning bear cub, and "bald", bold or brave. Secondly the origin may be French, and a derivative of the female given name "Anabel". If so this version was introduced into the British Isles after the famous Norman Conquest of 1066. Thirdly it could a "Crusader" name. That is a name of early Greek or biblical origins brough back to Europe by returning Crusaders of the 12th century. If so then the derivation is from Hannibal, the famous Carthaginian general of 247-182 b.c. who crossed the Alps with 40,000 men to defeat the Romans. This form was it is said, was also introduced into England in the medieval period by Italian spice-merchants and money lenders. A possible recording from this source was Thomas Hannyball, who is recorded in the register of students of Oxford University in 1513. Other recordings from around the end of the medieval period include John Anyable in the Subsidy Tax rolls of Suffolk in 1568, and later Simon Honeyball in the Hearth Tax rolls of Suffolk in 1692. 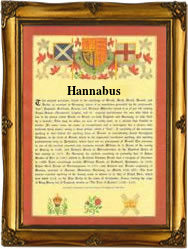 The first recorded spelling of the family name is shown to be that of Mathew Hanybal. This was dated 1255, in the Close Rolls of London, during the reign of King Henry 111rd, 1216 - 1272. Throughout the centuries, surnames in every country have continued to "develop" often leading to astonishing variants of the original spelling.